Offering an outdoor swimming pool and a spacious conference hall, Golden Metro Hotel is just 0.6 miles away from City Railway Station. Guests can enjoy free Wi-Fi access available throughout the property. 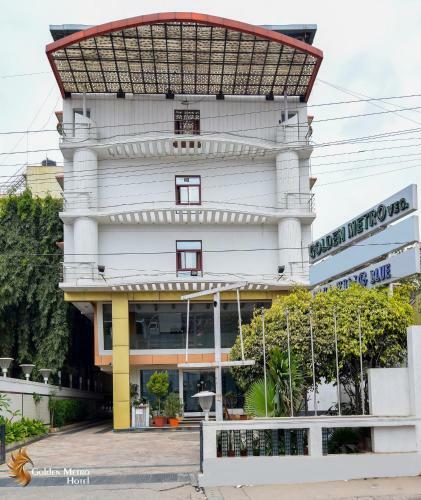 Conveniently located just 1.9 miles away from the ancient Bangalore Palace, the hotel is also 4.3 miles away from the beautiful Lalbagh Gardens and 21.1 miles to Bengaluru International Airport. Tastefully furnished, air-conditioned rooms are fitted with a satellite flat-screen TV, a personal safe and a sofa seating area. The en suite bathroom includes a shower and free toiletries. Enjoy refreshing workouts at the fitness centre. A 24-hour front desk can assist with laundry/ironing services as well as travel arrangements. Guests can enjoy a wide spread of Indian, Chinese and continental cuisines including vegetarian dishes at Golden Metro Veg Paradise. Sheshadripuram is a great choice for travellers interested in cold weather, nature and business. Golden Metro Hotel has been welcoming Booking.com guests since 27 Mar 2013. When would you like to stay at Golden Metro Hotel? Featuring unique decor and granite flooring, this air-conditioned room is fitted with a satellite LED TV, a personal safe and a sofa seating area. The en suite bathroom includes a shower and free toiletries. Featuring unique decor and wooden flooring, larger air-conditioned room is fitted with a satellite LED TV, a personal safe and a sofa seating area. The en suite bathroom includes a shower and free toiletries. Furnished with wooden flooring this room offer more space. Featuring a separate living area with a massage chair, this spacious air-conditioned suite is fitted with wooden flooring, 2 satellite LED TVs, a personal safe and a sofa seating area. The en suite bathroom includes a steam bath, bathrobes and free toiletries. House rules Golden Metro Hotel takes special requests - add in the next step! Golden Metro Hotel accepts these cards and reserves the right to temporarily hold an amount prior to arrival. Please inform Golden Metro Hotel in advance of your expected arrival time. You can use the Special Requests box when booking, or contact the property directly with the contact details provided in your confirmation. Could not stop AC during the night. Late arrival without problem. Nice and friendly staff. Provide the exact images of the property. I have booked the hotel based on my gym requirement. But the gym was too old & the machinery were also rusted. It was not at all in working condition. Also daily morning breakfast was same. There was no change. The staff present during breakfast is also dull. In fact the hotel is not worth for the money which we have paid.